Though I’m claiming this as a walk, it was more of a wander, with ample time to stoop to admire diminutive beauties along the way. Lovers of toe-high winter irises – well, two toes high, if you must – will find plenty of opportunities at Bodnant to challenge their knees. The earliest daffodils were out – this one is Narcissus ‘Rijnveld’s Early Sensation’ – a mere hint of the displays you’ll see if you visit Bodnant in the spring. I love the way the constituent parts of any large, historic garden have acquired simple but evocative reference names down the years. This is one way we can be inspired by public gardens: I’d contend that almost every domestic garden gains from having named areas. Bodnant has The Dell, The Glades, The Far End, Furnace Wood, The Lily Terrace, The Pin Mill, and the Poem, a last resting place for family members, perched at the top of a rock face overlooking the waterfall. From the winter garden, we took a narwhal shaped route opposite the Ha-Ha, through the glades, past Poem to the waterfall, along the stream to Old Mill, up the five terraces back to the winter garden. Winter is a great time to see the structure of a garden, such as the arbours, trellises and obelisks on the lower rose terrace. One of my favourite winter plants is on the lower rose terrace too, providing a leafy wallpaper behind a bench: this Trachelospermum jasminoides. The roses had been pruned back, so we only saw one straggly looking yellow one. 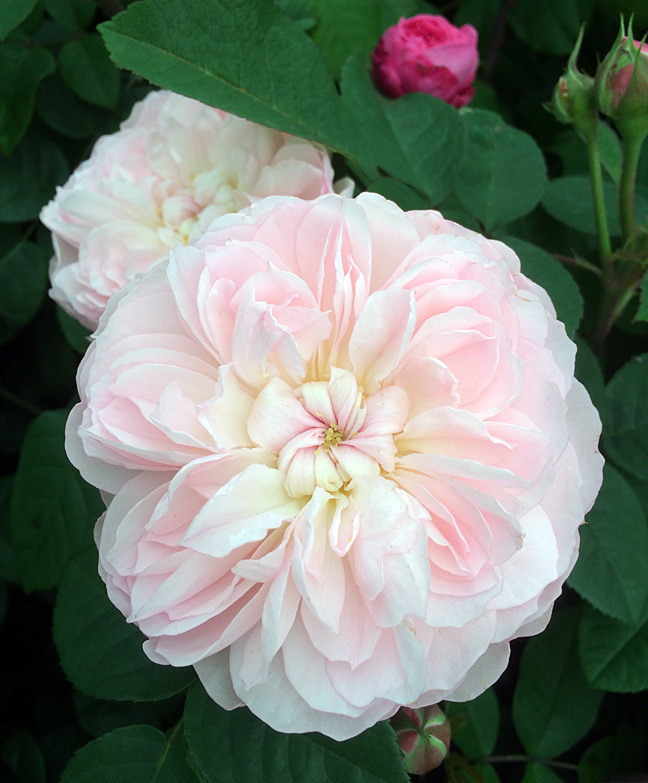 (Click here for a peek at Bodnant’s roses in flower). If you think that rhodos are dull in winter, Bodnant may make you change your mind. The garden holds the National Collection of Rhododendron forrestii and has hundreds of hybrids. I’m not sure how they came to be so architectural as the one above on the left, but I suspect deft, artistic pruning. The building on the right is the Old Mill – a source of coffee and cake on busier days, but closed during our visit. We did not go cakeless, picking up a massive slice of spiced apple cake from the cafe by the entrance for £3.25. 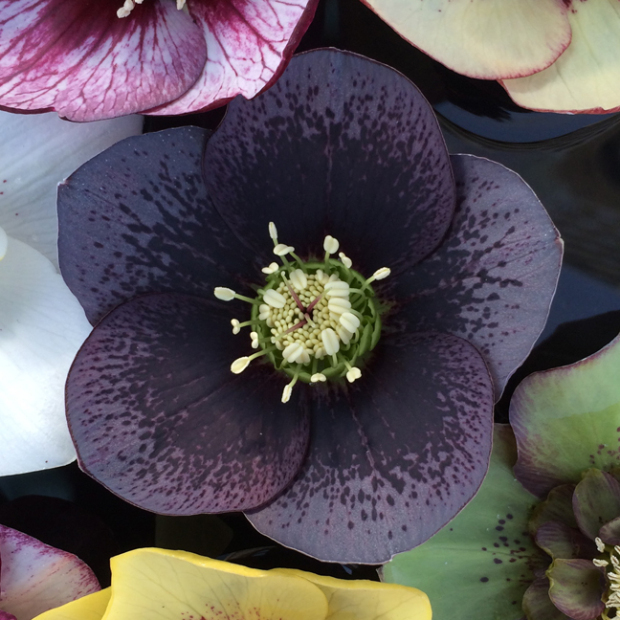 Bodnant has an interesting collection of hellebores, both species and hybrids, mainly sourced from Ashwood Nurseries. You’ll find named and unnamed hybrids along the paths connecting the winter garden to the lower terraces, the Dell and the river walk. A smaller but choice collection of species hellebores and other interesting plants is in the terrace borders leading to the Lily Terrace from the house (walk almost all the way through the top rose terrace, keeping the mountains on your left, then take the path down). The winter garden can have fragrance: Daphne bholua ‘Jacqueline Postill’ is as scented as any rose, with power to pull people down the path, noses in the air, seeking out the source. Ready for home, (the air was crisp rather than bone-shivering, but my sweetheart and I were both trying to walk off colds) we peeked down the sleeping laburnum arch which was being tidied up by gardeners and headed off past a Ribes laurifolium, covered in tiny racemes of creamy-green flowers. I had read that this plant should never be pruned, but it didn’t seem to have taken any offence to being trained against a wall. Heading off back under the tunnel to the car park, we passed cherry trees, dogwoods and snowdrops that together lit up their little patch of land before lighting up our tastebuds with that gingery spiced apple cake I mentioned. *Bodnant is an National Trust property and a Royal Horticultural Society partner garden so NT and RHS members have free entry. Shared as part of Jo’s Monday walk. That is so beautiful. And how can they grow irises so successfully in the ground when they must have just as much cold, wet rain as I do? I did see some irises looking a little frail in places after the rain and the snow, but there were plenty of sturdy-looking ones too. I suppose the trick is to enjoy them while they last. Iris reticulatas always look as if they need splitting, no matter what garden I see them in. In contrast whenever I see violas planted, I always think they ought to be closer together. What a wonderful garden!!! Thank you for sharing your your beautiful pictures and telling us about this amazing place. Meanwhile in Toronto area, Canada, we have another snow storm coming and no sign of springs probably at least till the end of March or longer. I dare say that will make it all the more welcome when it arrives. What a gorgeous place. Parts of the UK are obviously much closer to spring than northern Virginia. That rhododendron made me think instantly of the landscapes of John Nash. I don’t know enough about him to know if he worked in or close to Wales, but wow, what a picture. I did a bit of searching and found paintings from S. Wales and Scotland as well as England. He’d have loved Bodnant, if he had the chance to visit – it has all his favourite ingredients. I’m not familiar with his work but you have piqued my interest to find out more. Bodnant seems a delight to the eye and beauty abounding in every direction. Did you do the walk over one day or several ? Seems like many of the plants are able to flower through the year, even in winter or am I mistaken? Do you have a picture of the snow covered mountains opposite the park ? I loved the waterfall. The feel of people buried on the property seems eerie. 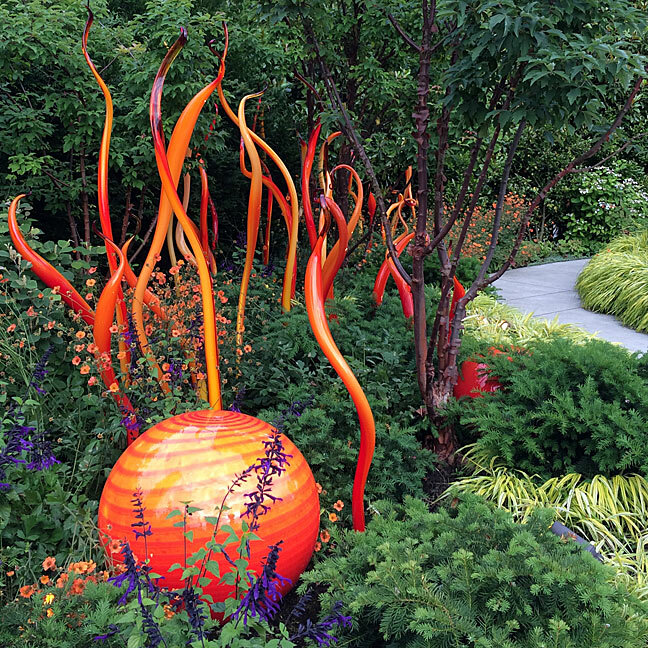 I think this garden must be visited in every season to see how its landscape changes. We did this walk one afternoon, but it could easily be lengthened or shortened. The only thing you’d struggle to find is a flat walk as it is on a hillside. Bodnant have a wonderful picture of the view from the terraces to the snow covered mountains on their website at the moment. I linked to it in the visitor information at the end of the post. I love Bodnant but hae not been there for many years. Thanks for the lovely photos. You took me on a virtual trip. I tried to send a comment yesterday evening, but it wouldn’t go through, and of course I couldn’t remember what you said should be done when that happened. So I am sending this to see if it gets to you. That must have been frustrating. I’m glad it’s working now! Looks as though it worked this time and so I can tell you how wonderful I found this post about Bodnant. Of course I clicked on the link to the roses — what a contrast in the seasons’ disparate beauties. I was particularly struck by the beauty in that last photo above. Whether from the thought of the spice apple cake or the suggestion of bonfires in the plants, I felt much warmed by that image. It’s a lovely, lovely photo. The lighting in the last picture is perhaps a little dark for some tastes, but I like it too – the plants seem to glow. This kind of walk (a virtual one) might assuage a little wanderlust until you are fully acquainted with those knees. Wow! What a glorious garden and such an inspiring post Susan. Thank you. It is an inspiring garden, and it is good to see that it is actively being developed with new parts scheduled to open next year. I have never been there and it looks incredibly beautiful and full of plant delights to inspire. It is a big plus when a garden has genuine interest all year round, as this one has. 229,512 hits - thanks for stopping by!